Want a free ticket to the festival? Post just ten fliers in your neighborhood! Contact Gabe Wigtil (gabe.wigtil@sonorandesert.org or 388-9925) for more information! Tickets on sale NOW at Summit Hut (5045 E Speedway Blvd and 605 E Wetmore Rd) Antigone Books (411 N 4th Ave), and the Tucson Audubon Nature Shop (300 E University Blvd). This amazing event features films that will reach the audience through beautiful imagery and inspire individuals to get involved in conserving the Wild & Scenic places close to home. The feature film of the evening is Eric Bendick’s “Division Street.” This film highlights the environmental challenges presented by North America’s vast system of roads. This film looks at the promise of wildlife corridors, the potential for ‘greening’ our highway system, and the fusion of high-tech engineering with the best and brightest environmental research happening today. Buy a ticket for your friend; invite your Facebook network; donate an item to the raffle. You can help make this event a success! The Coalition is honored to be a beneficiary of this event. This race features 8-mile and 5k courses looping through a cactus forest in the foothills of the scenic Rincon Mountains at Saguaro National Park East. Click here for more information and to register to run! Lots of prizes and awards for participants, plus a great way to experience Saguaro National Park! Our supporters have been challenged to match the $2000 donation from the Southern Arizona Roadrunners. Your donation today will help us exceed that goal! With over 800 race participants, each additional $25 donation could quickly become over $20,000 to help support the work of the Coalition! Please donate now to meet this challenge! Long-time supporter Bruce Gungle is once again competing to benefit the Coalition. This time he is racing in the Furnace Creek 508, the world’s premier ultramarathon bicycle race, set in the heart of southern California. We will be sending additional information in the upcoming weeks on how you can contribute! More information about the race at www.the508.com. 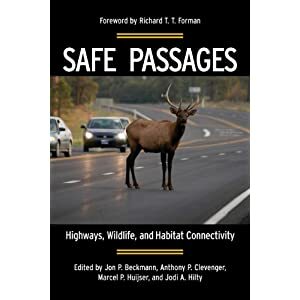 Safe Passages: Highways, Wildlife, and Habitat Connectivity (Island Press) is now available! Coalition staff members Carolyn Campbell and Kathleen Kennedy contributed a chapter to this exciting new publication. The chapter is entitled "The Sonoran Desert Conservation Plan and Regional Transportation Authority: Citizen Support for Habitat Connectivity and Highway Mitigation." Copies of Safe Passages are available locally from the Tucson Audubon Nature Store, 300 E. University Blvd. or Antigone Books, 411 N. 4th Avenue. View our press release here. Action Alert: Tell ADOT To Protect the Environment! The Arizona Department of Transportation (ADOT) requests your thoughts and ideas about Arizona’s Long-Range Transportation Plan (LRTP). According to ADOT, "This is the start of the state’s long-range transportation plan – also called What Moves You Arizona – to bring together all residents, visitors, drivers and anyone else who will need to get around, to create a vision for the future of transportation, be it by car, bus, bike path or sidewalk. This isn’t just a vision: it’s a process to estimate needs and available funding, and create a framework for making decisions in the years ahead… By completing this survey you will assist us in focusing the state’s transportation vision and developing measurements critical to track success of the Long-Range Transportation Plan." One of the Plan goals is to "Protect the environment and natural resources." By filling out the survey, you can voice your support for this important goal. We must take advantage of this opportunity to tell ADOT that protecting the environment and mitigating for the impacts of our transportation network on wildlife habitat is extremely important and appropriate! We must take advantage of this opportunity to tell ADOT that protecting the environment and mitigating for the impacts of our transportation network on wildlife habitat is extremely important and appropriate! *Preserving wildlife linkages and mitigating for the impacts of our growing transportation network on wildlife habitat should be a primary goal of the Long-Range Transportation Plan. *Wildlife linkages are an essential component of Arizona’s many diverse ecosystems. As we look ahead and try to create a vision for the future of transportation in Arizona, we must take into account the impact transportation has on wildlife movement and the fragmentation of wildlife habitat. *If we do not integrate wildlife concerns into our future vision for transportation, Arizona’s landscapes, wildlife habitat, and wildlife habitat will be forever harmed and fragmented. *Integrating wildlife linkage concerns with transportation planning not only benefits wildlife but also public safety. Wildlife underpasses and overpasses can dramatically reduce collisions between wildlife and vehicles. *New roads should not be built through Arizona’s environmentally-sensitive areas. *ADOT should abandon the proposed I-10 bypass plan. Survey ends August 31st, 2010. Action Alert: Protect the Land of Legends! The Whetstone, Dragoon, and northern Chiricahua mountains are part of our scenic natural and cultural heritage – our Land of Legends. These historic treasures provide unparalleled outdoor recreational opportunities, intact habitat for Arizona’s endangered wildlife, clean water, cultural and spiritual values and the scenic beauty that make Cochise County a desirable place to live. View of the Whetstone Mountains, across the Las Ciengas National Conservation Area, one of the largest remaining intact grasslands in Arizona. Photo: Sky Island Alliance. Wilderness designation is the best solution to permanently protect these publicly owned remnants of wild Arizona, as they are now, and for future generations to enjoy. Towards that exciting purpose, Sky Island Alliance has set a goal to gather 1,500 names in support of Land of Legends Wilderness by the end of October. Sign the online support form for Land of Legends Wilderness. Over 400 people have voiced their support so far… with your help, we can make a difference! Questions? Contact Jessica Lamberton: jessica@skyislandalliance.org, 520-624-7080 x21. Sonoran Desert through comprehensive land-use planning. and to direct development to less biologically sensitive areas. Join the Coalition on Facebook!